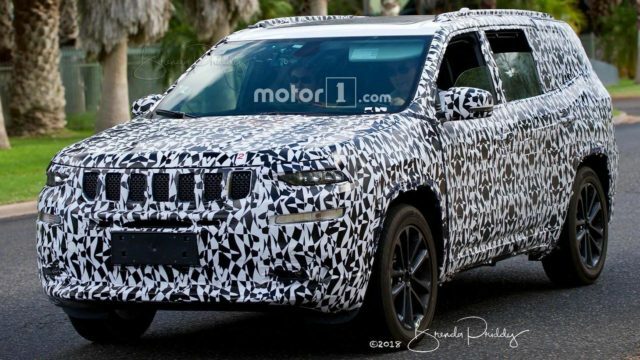 The guys from Motor1 have managed to get a few spy shots of Jeep’s future full-size SUV. 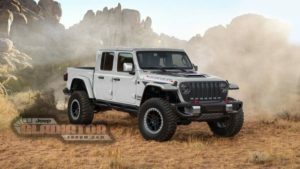 More precisely, you are looking the prototype of what appears to be the 2020 Jeep Wagoneer. This is reportedly the smaller version of the popular Woody, so we can’t wait to see the bigger, Grand Wagoneer. As for the testing mule, well, according to them, this isn’t going to be the final version of the returning SUV. No, this is allegedly just the beginning, so the production model could look totally different. We, on the other hand, think that the pre-production prototype isn’t going to feature too many changes. The camouflaged vehicle shows clear contours of Jeep’s latest design language, and what’s more important, why would anyone bother to create as good mule? Compared to the smaller Grand Cherokee, the future Wagoneer SUV shows a bit brawnier exterior, yet it might have pretty must the same front end. As far as we can see, the front end will feature the distinctive seven-slat grille coupled with mesh patterns. In addition, the headlights appear to be very slim, while the most striking detail could be a massive front bumper. 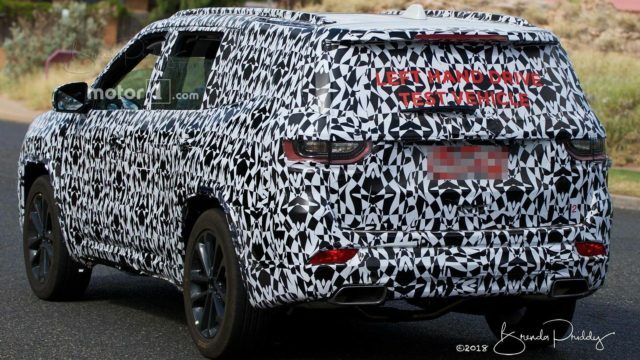 In the rear, the 2020 Jeep Wagoneer looks to have a pair of LED taillights (also slim), and an inconspicuous bumper with a pair of exhaust pipes. The overall exterior design is pretty boxy. This may be a bad decision for SUV’s fuel economy, but it’s definitely the fantastic move for the interior space. This way, even the regular Wagoneer will provide enough space for all seven passengers. 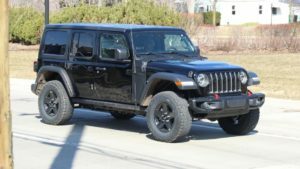 Still, according to what we know, the 2020 Jeep Wagoneer will not be able to come close the future Grand Wagoneer, simply because the bigger brother is going to provide more space and significantly upscale features. Performance wise, well, everything seems so fuzzy at the moment, so we can just get bring just some assumptions at the moment. The new-gen Wagoneer will definitely use a new aluminum-intensive platform, but that’s everything we know about the future architecture at the moment. The SUV will reportedly feature several engine options. The carmaker will probably start with some kind of V6, or maybe even with a new turbo-four. The next generation 5.7 Hemi V8 is reportedly coming in 2018, so it’s a safe bet, too. The carmaker won’t miss the chance to add a Hellcat-powered Jeep Wagoneer as well, but that’s not going to happen right away. Most of the options will be mated to an eight-speed automatic transmission. Any kind of manual gearbox is out of the question of course. The base Wagoneer should cost around $50,000. However, if you want the real deal, or more precisely, the fully-loaded Grand Wagoneer, you will probably need to have around $140,000.